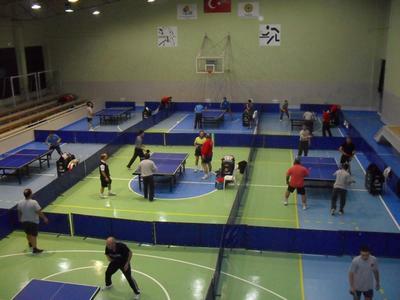 Izmir Veteran Table Tennis Players Association (IZVET), founded 2007, is a volunteer-run, non-profit and official organization dedicated to furthering the sport of table tennis in the Izmir area. With a growing membership of more than 100 covering all ages, IZVET is one of the most prominent Table Tennis Associations in Türkiye. The association itself is located in a 1000 sq mt indoor sports hall called Izvet Arena, featuring more than 9 tournament quality tables - approved by ITTF (25 mm and Yasaka Progress) for recreational play, very high ceilings, showers & changing rooms, restrooms, cafeteria and parking spaces. It is the premier table tennis facility in Izmir with hundreds of regular young and veteran players, 7 days in a week business hours (weekdays: 18:00 - 22:00, weekends: 10:00 - 22:00) that fit nearly any schedule, and a welcoming environment for beginners and veterans alike. Membership is required but visitors are always welcome. Daily fee is 5 EU for non-members. IZVET is currently looking for new members of all standards. The mission of the association is to support everyone of all ages who love table tennis in the Izmir area by providing facilities, equipment, organization, training and coaching to learn and compete in the sport of table tennis. 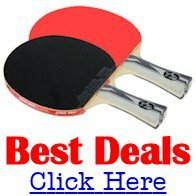 Skill in the sport of table tennis promotes physical conditioning, better hand eye coordination, and learning sportsmanship, civility, fair play and team work. 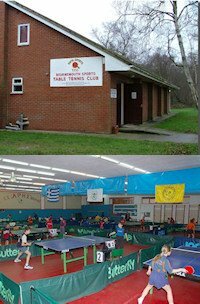 The association provides supervision and training by certified table tennis coaches. The association organizes annual local open, veteran, rating, team, institutional leagues and international veteran tournaments.